July 16, 2015 – Three crew members on the International Space Station are resuming normal operations after getting an all clear from Mission Control following a close pass by Space debris this morning at 7:01 a.m. CDT. As a precautionary measure, crew members Scott Kelly, Gennady Padalka and Mikhail Kornienko moved to the Soyuz spacecraft that was docked at the station. This was the fourth time in the history of station operations that the crew moved to a Soyuz due to a potential close pass of debris. This debris was from an old Russian weather satellite. NASA takes the threat of collisions with space debris seriously and has a long-standing set of guidelines on how to deal with each potential collision threat. These guidelines, part of a larger body of decision-making aids known as flight rules, specify when the expected proximity of a piece of debris increases the probability of a collision enough that evasive action or other precautions to ensure the safety of the crew are needed. On June 8, 2015 International Space Station flight controllers conducted a pre-determined avoidance maneuver (PDAM) to steer the station well clear of a fragment of a spent Minotaur rocket body launched in 2013. 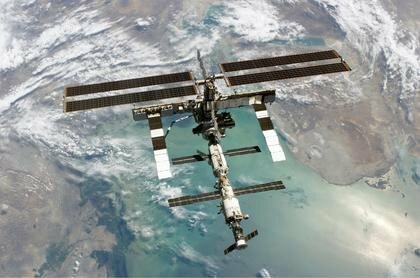 Having tracked the object throughout the weekend, U.S. and Russian flight controllers executed a 5 minute, 22 second firing of the ISS Progress 58 thrusters to slightly raise the station’s orbit and distance it from the fragment that was projected to pass within three statute miles of the complex later in the day. Space debris encompasses both natural (meteoroid) and artificial (man-made) particles. Meteoroids are in orbit about the sun, while most artificial debris is in orbit about the Earth. Hence, the latter is more commonly referred to as orbital debris. 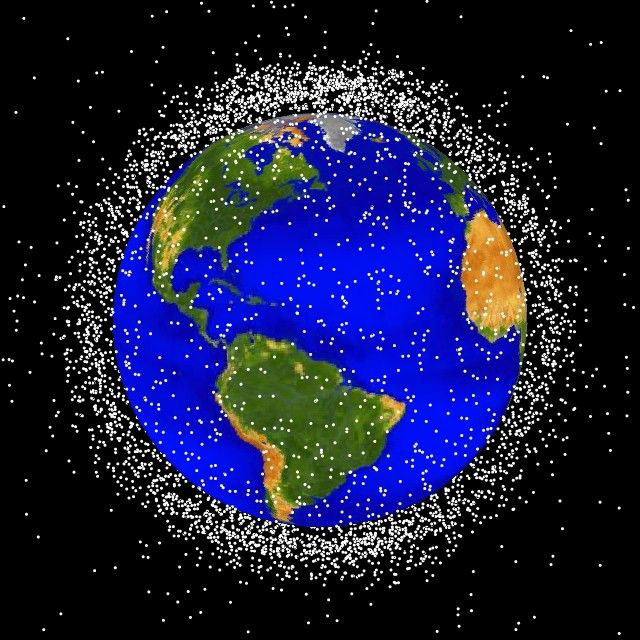 There are more than 20,000 pieces of debris larger than a softball orbiting the Earth. They travel at speeds up to 17,500 mph, fast enough for a relatively small piece of orbital debris to damage a satellite or a spacecraft. There are 500,000 pieces of debris the size of a marble or larger. The greatest risk to space missions comes from non-trackable debris. There are many millions of pieces of debris that are so small they can’t be tracked and even tiny paint flecks can damage a spacecraft when traveling at these velocities. Collision risks are divided into three categories depending upon size of threat. For objects 4 inches (10 centimeters) and larger, conjunction assessments and collision avoidance maneuvers are effective in countering objects which can be tracked by the Space Surveillance Network. Objects smaller than this usually are too small to track and too large to shield against. Debris shields can be effective in withstanding impacts of particles smaller than half an inch (1 centimeter). NASA has a set of long-standing guidelines that are used to assess whether the threat of such a close pass is sufficient to warrant evasive action or other precautions to ensure the safety of the crew. These guidelines essentially draw an imaginary box, known as the “pizza box” because of its flat, rectangular shape, around the space vehicle. This box is about a mile deep by 30 miles across by 30 miles long (1.5 x 50 x 50 kilometers), with the vehicle in the center. When predictions indicate that the debris will pass close enough for concern and the quality of the tracking data is deemed sufficiently accurate, Mission Control centers in Houston and Moscow work together to develop a prudent course of action. Sometimes these encounters are known well in advance and there is time to move the station slightly, known as a “debris avoidance maneuver” to keep the debris outside of the box. Other times, the tracking data isn’t precise enough to warrant such a maneuver or the close pass isn’t identified in time to make the maneuver. In those cases, the control centers may agree that the best course of action is to move the crew into the Soyuz spacecraft that are used to transport humans to and from the station. This allows enough time to isolate those spaceships from the station by closing hatches in the event of a damaging collision. The crew would be able to leave the station if the collision caused a loss of pressure in the life-supporting module or damaged critical components. The Soyuz act as lifeboats for crew members in the event of an emergency. Mission Control also has the option of taking additional precautions, such as closing hatches between some of the station’s modules, if the likelihood of a collision is great enough. NASA has a set of long-standing guidelines that are used to assess whether the threat of a close approach of orbital debris to a spacecraft is sufficient to warrant evasive action or precautions to ensure the safety of the crew. Debris avoidance maneuvers are planned when the probability of collision from a conjunction reaches limits set in the space shuttle and space station flight rules. If the probability of collision is greater than 1 in 100,000, a maneuver will be conducted if it will not result in significant impact to mission objectives. If it is greater than 1 in 10,000, a maneuver will be conducted unless it will result in additional risk to the crew. Debris avoidance maneuvers are usually small and occur from one to several hours before the time of the conjunction. Debris avoidance maneuvers with the shuttle can be planned and executed in a matter of hours. Such maneuvers with the space station require about 30 hours to plan and execute mainly due to the need to use the station’s Russian thrusters, or the propulsion systems on one of the docked Russian or European spacecraft. Several collision avoidance maneuvers have been conducted during the past 10 years. NASA implemented the conjunction assessment and collision avoidance process for human spaceflight beginning with shuttle mission STS-26 in 1988. Before launch of the first element of the International Space Station in 1998, NASA and DoD jointly developed and implemented a more sophisticated and higher fidelity conjunction assessment process for human spaceflight missions. In 2005, NASA implemented a similar process for selected robotic assets such as the Earth Observation System satellites in low Earth orbit and Tracking and Data Relay Satellite System in geosynchronous orbit. In 2007, NASA extended the conjunction assessment process to all NASA maneuverable satellites within low Earth orbit and within 124 miles (200 kilometers) of geosynchronous orbit. DoD’s Joint Space Operations Center (JSpOC) is responsible for performing conjunction assessments for all designated NASA space assets in accordance with an established schedule (every eight hours for human spaceflight vehicles and daily Monday through Friday for robotic vehicles). JSpOC notifies NASA (Johnson Space Center for human spaceflight and Goddard Space Flight Center for robotic missions) of conjunctions which meet established criteria. JSpOC tasks the Space Surveillance Network to collect additional tracking data on a threat object to improve conjunction assessment accuracy. NASA computes the probability of collision, based upon miss distance and uncertainty provided by JSpOC. Based upon specific flight rules and detailed risk analysis, NASA decides if a collision avoidance maneuver is necessary. If a maneuver is required, NASA provides planned post-maneuver orbital data to JSpOC for screening of near-term conjunctions. This process can be repeated if the planned new orbit puts the NASA vehicle at risk of future collision with the same or another space object.